Sarah Liptrott is a Clinical Research Nurse in the Division of Haematology/BMT at the IEO. She graduated from Liverpool University with a Bachelor of Nursing (Hons), and obtained her Masters Degree at Staffordshire University. Throughout her career, Sarah has specialised within oncology, working within surgery and medicine as well as chemotherapy units. In her role as Clinical Nurse Specialist she developed nurse led clinics and implemented nurse prescribing into the haemato-oncology field. 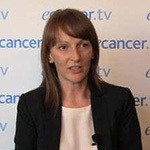 She has worked as Clinical Trial Team Leader responsible for the research team and achievement of UK national targets. Sarah has authored or co-authored numerous articles in high-quality scientific journals as well as being an invited reviewer. Her educational developments include BMT training/chemotherapy/clinical trials in both UK and European settings. She has served on many committees including the European Group for Blood and Marrow Transplantation Nurses Group Research Sub Committee and is a member of the RCN – Cancer Forum and Haematology & BMT Forums.